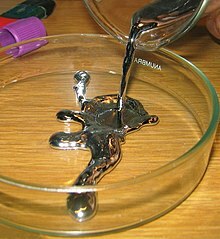 "In China and Tibet, mercury use was thought to prolong life, heal fractures, and maintain generally good health, although it is now known that exposure to mercury leads to serious adverse health effects." Wainuiomata in Lower Hutt doesn't often set national records - but yesterday the mercury climbed to a high of 32.3°C. Wainuiomata in Lower Hutt stellt nicht oft nationale Rekorde auf - aber gestern ist die Quecksilbersäule auf ein Hoch von 32,3°C geklettert. ↑ New Zealand - Lower Hutt town takes North Island hotspot. RNZ Radio New Zealand, New Zealand, 29. Januar 2018, abgerufen am 29. Januar 2018 (Englisch).